Doug, virtuoso of the six-string, began playing in 1977 at the tender age of 15. He loved his instrument from the first time he handled it. His joy became complete when he began playing with the band, at a time when playing with himself seemed not quite fulfilling. Past musical adventures included the locally popular band Crystal Rain, the not so popular band Legynd, both of these bands way….way back in the 80’s and, most recently, the kind’ve popular Yard Rats. 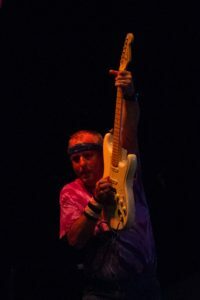 Doug’s major influence is Pink Floyds’ David Gilmour who, to quote Doug, “really rocks”. Doug is also a licensed pilot and is hoping the band gets booked at some airports so he can fly the corporate plane to the gigs. Doug currently resides in a dark corner in Perry w/ his wife and several species of small, furry animals.